Beekeepers expect some of their bees to die off from season to season – typically, around 17 percent annually. But in recent years, losses have been more than twice as high. 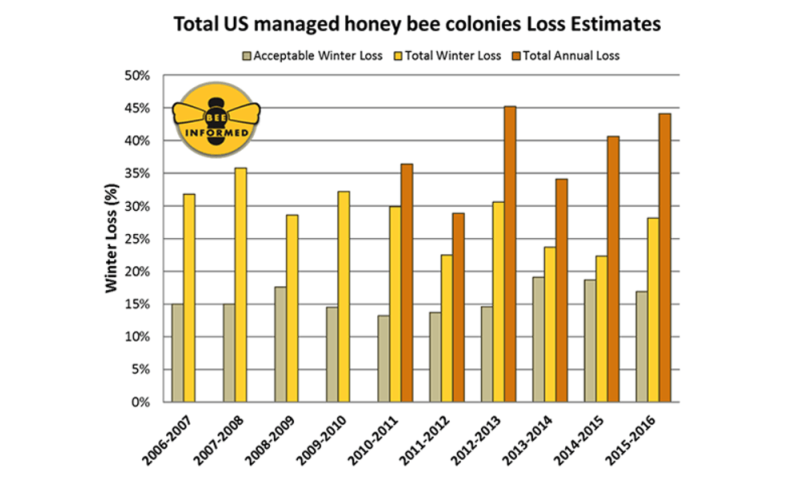 In 2006 beekeepers in the United States reported that a mysterious affliction, dubbed Colony Collapse Disorder (CCD), was causing widespread die-offs of bees. In colonies affected by CCD, adult workers completely disappeared, although plentiful brood (developing bees) and the queen remained. Beekeepers found no adult bees in and around the hives, and noted that pests and bees from neighboring hives did not immediately raid the affected hives, as might be expected. Beekeepers' biggest challenge today is probably Varroa destructor, an aptly named parasitic mite that we call the vampire of the bee world. Varroa feeds on hemolymph (the insect "blood") of adult and developing honey bees. In the process it transmits pathogens and suppresses bees' immune response. They are fairly large relative to bees: for perspective, imagine a parasite the size of a dinner plate feeding on you. And individual bees often are hosts to multiple mites. Beekeepers often must use miticides to control Varroa. Miticides are designed specifically to control mites, but some widely used products have been shown to have negative effects on bees, such as physical abnormalities, atypical behavior and increased mortality rates. Other currently used commercial miticides have lost or are rapidly losing their efficacy because Varroa are developing resistance to them. Our laboratory is evaluating several novel biopesticides for effectiveness against Varroa and safety to bees. These products are mostly plant-based, and are designed to be used as part of an integrated pest management (IPM) plan. IPM emphasizes prevention and monitoring of pests and using a range of control methods to minimize negative effects on the environment. Another potential strategy is breeding Varroa-resistant bees. Our research explores biological processes that regulate the honey bee queen mating process. To breed pathogen- and parasite-resistant honey bee stock, we often need to useinstrumental (artificial) insemination. We hope to help improve that process by understanding which seminal fluid proteins from male honey bees (drones) cause specific post-mating changes in queens, such as triggering egg-laying or contributing to queen bees' longevity. Honey bees also are exposed to viruses, bacterial diseases and fungi. For example, deformed wing virus (DWV) causes wing deformities that prevent bees from performing normal work functions such as foraging for food. Viruses have been implicated as an important factor in honey bee health declines, but we are just starting to understand how honey bees' immune systems fight against them. We may be able to help strengthen bees' immune responses by making diverse foraging resources, such as a variety of wildflowers, easily accessible. Questions about how pesticides affect honey bee health have spurred passionate debate. One key issue is whether neonicotinoids, a class of insecticides that affect insects' nervous systems, are causing widespread bee deaths. The U.S. Environmental Protection Agency is currently reviewing possible risks to pollinators from neonicotinoids. Its first results, released earlier this year, found that the pesticide imidacloprid can have negative effects when it is present at concentrations above thresholds that can sometimes be found in certain crops, including citrus and cotton. There are many gaps in our knowledge about neonicotinoids and other types of pesticides. We have little understanding about the impacts of pesticide combinations and how they affect developing bees and other pollinators. To fill some of those gaps, our lab is testing combinations of various agriculturally important pesticides on adult worker survival and queen development. Studies show that when bees have access to optimal nutrition, they are better able to deal with diseases and pesticides. But intensive farming and urbanization have reduced the amount of readily available forage that bees need to thrive. Research labs at UC-Davis and elsewhere are analyzing what types of flowering plants provide the best supplemental forage for bees. Growers can support bees by planting these species near their crops. Second, reduce your pesticide use for gardening and landscaping, and follow guidelines to reduce bee exposure. Finally, you can support local beekeepers by buying their honey. Ultimately, however, making our society more pollinator-friendly will likely require some drastic and long-term changes in our environmental and agricultural practices.